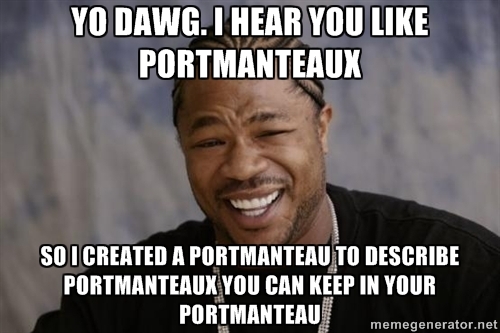 The Portmanteau Word: It’s like a Turducken*! You see it’s like a portmanteau—there are two meanings packed up into one word. English is the world’s language, and it’s easy to see why. Maybe it’s British colonialism or American exceptionalism, but the way I see it, English is supreme because it’s so accommodating. 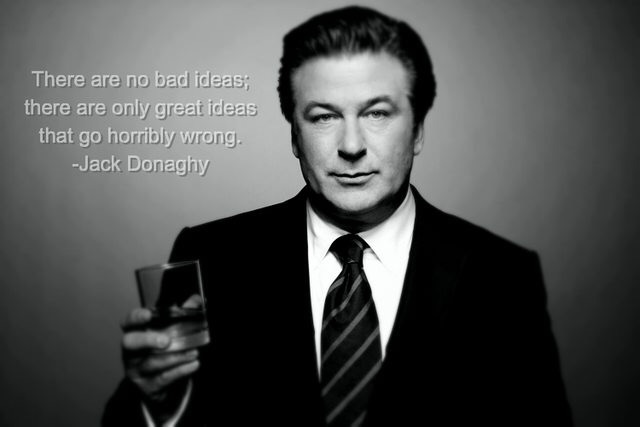 ** We have no Academy Anglaise shutting down innovation and forbidding loanwords. As a result, English is alive and vibrant, but it also festers with unorthodox orthography (courtesy of these foreign loanwords) and bad ideas gone horribly wrong. Smarketing — but shouldn’t all marketing be smart marketing? Threepeat — is still a repeat, thank you. Decruiting — because we enjoyed rightsizing so much. Any formation with man (mansplain, mancriminate, manspreading) — we’ve covered the idiocy of murse, meggings, and mandals. I concede the man words have an edge of misandry which makes them both telling and funny. Any formation with mom — Stephanie also-from-Virginia writes: “Last night I heard one that made me cringe. Momager. It was in reference to Kris Jenner, which I think made it even more painful.” Agreed. More positive is momtrepreneur, but again, it’s redundant. Isn’t entrepreneur sufficient? Procrasturbation — suggested by Erik in California. Since this is a family-friendly site, I’m going to assume it involves putting off productive work by navel-gazing. Blamestorming — No explanation needed. 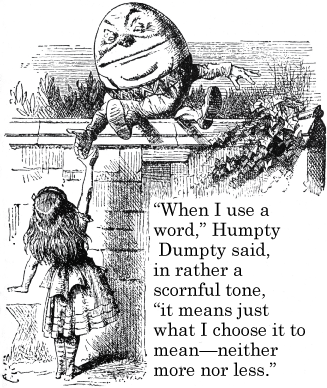 Portmanteau — Lewis Carroll created the lexical meaning, but he didn’t create the word. It already existed in English to describe a suitcase for clothing, made by combining the French porter (to carry) and manteau (cloak) — in other words, portmanteau is itself a portmanteau. Now that’s meta. Cue Xzibit! *Because I used the word, here is a turducken. This entry was posted in commentary, sightings, words on October 15, 2015 by mark.